This Valentine's Day, make a difference by going ethnic. 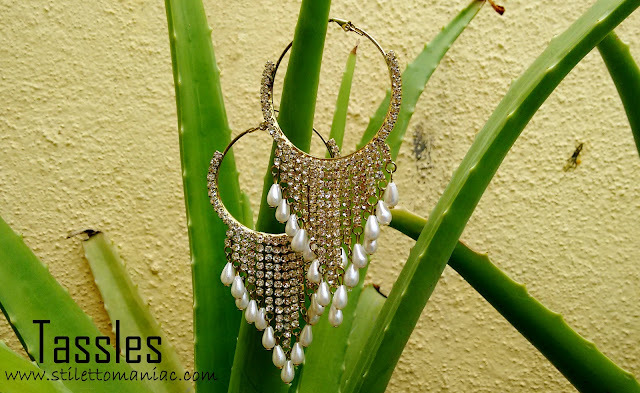 Or you can just add an ethnic touch to your outfit by donning these trendy earrings. 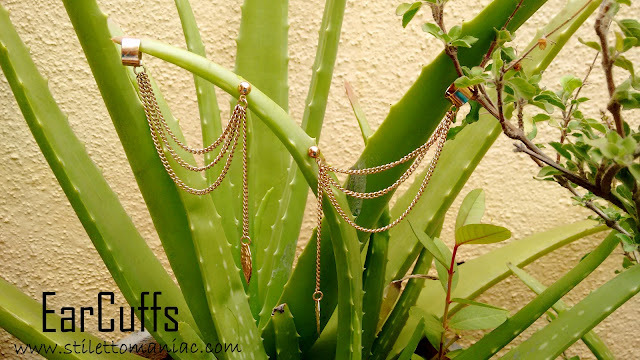 The fourth trend though is of ear cuffs which again can be worn both on western and Indian wear! I picked up what suited the current trend from my jewelry stash and photographed it for this post. It took a lot of time for me to click these pictures because between all the photographing, I started wearing these earrings and looking at myself in the mirror, clicking selfies and what not! *narcissist alert* :P Anyhow, these are my very favorite earring trends at present. Not just any jhumkas but big, huge ones! 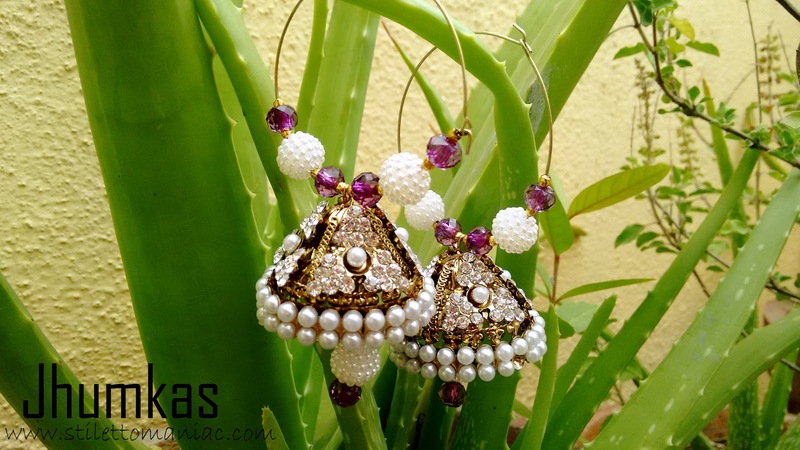 Jhumkas are the peppiest earrings which go with any ethnic outfit. They look best on Anarkalis and Sarees. 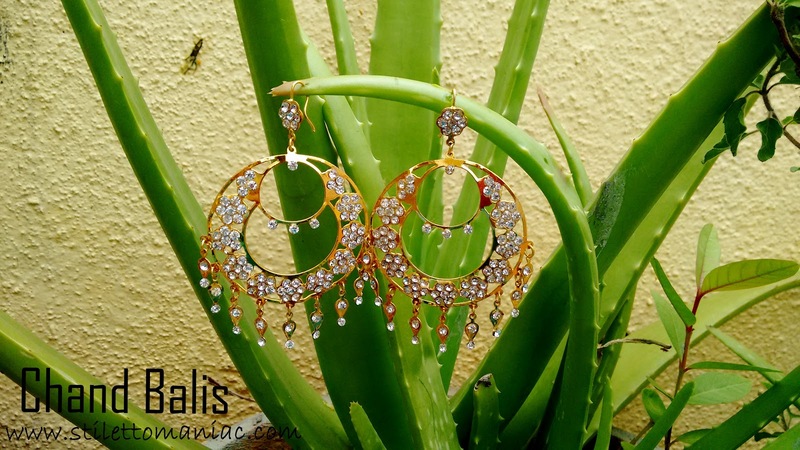 This season is all about volume, flaunt these huge jhumkas and you are sure to grab all the attention. This pair is one with intricate pearl and stone design. The beads just add extra oomph to it. I bought them from a store at commercial street Bangalore. I didn't know which dress I would pair them with when I picked them up but I simply couldn't walk away from that shop leaving these gorgeous beauties. I got them for around 399/- after a little bargain and they are totally worth it! Another cute trend and one of my personal favorites because they are AMAZINGLY light. Just like a feather but they give you a heavy look. To look at, they look quite heavy but the one who's wearing them knows that they weigh like a feather. Super comfortable and chic! Again, bought them from another store at commercial street, Bangalore. These are the current rage and the peppiest earnings of the season! Sadly, they don't quite fall into teh comfort category so avoid wearing them. I have like five pair of different ear cuffs and just one of them is comfortable to wear. So is you are ready to compromise on the comfort bit, these will help you steal the show! Simply very peppy and irresistible. Bought them from Amazon. These are the most expensive out of the four pairs. Which trend would you like to flaunt this season? Do share and also, anyone who wants a detailed post on each trend with actual photographs can ping me! Nature is one of the greatest gifts our planet has to offer the human race. Not only is the natural world full of beauty and possibilities for adventure, studies have proven that exposure to nature improves our physical and mental health. However, when it comes to embracing the great outdoors, there is a huge difference between enjoyment and survival. It is one thing to embark on a weekend long camping trip, and another thing altogether to survive in the wild when all goes amiss. Would you be able to survive if you became stranded on your next casual outdoor exhibition? What would you eat? How would you gather water? Would you have the skills you need in order to ensure your safety and sustenance. Great post. Buy earrings online at Rockrush.com.